Is Herbalife a Buffett Stock? Warren Buffett attracts a lot of attention. As the world's third-richest person and most celebrated investor, thousands try to glean what they can from his thinking processes and track his investments. While we can't know for sure whether Buffett is about to buy Herbalife (NYS: HLF) -- he hasn't specifically mentioned anything about it to me -- we can discover whether it's the sort of stock that might interest him. Answering that question could also inform whether it's a stock that should interest us. Good returns on equity with limited or no debt. Does Herbalife meet Buffett's standards? Buffett is famous for betting on a sure thing. For that reason, he likes to see companies with demonstrated earnings stability. Source: Capital IQ, a division of Standard & Poor's. Free cash flow is adjusted based on author's calculations. 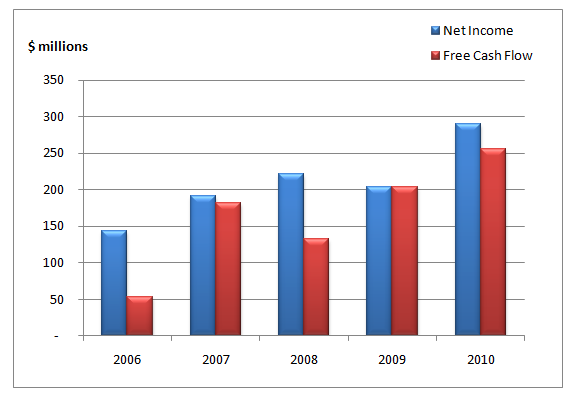 Over the past five years, Herbalife has generated consistent and growing earnings and free cash flow. Return on equity is a great metric for measuring both management's effectiveness and the strength of a company's competitive advantage or disadvantage -- a classic Buffett consideration. When considering return on equity, it's important to make sure a company doesn't have an enormous debt burden, because that will skew your calculations and make the company look much more efficient than it actually is. Since competitive strength is a comparison between peers, and various industries have different levels of profitability and require different levels of debt, it helps to use an industry context. Herbalife generates enormous returns on equity while employing fairly minimal debt by focusing on marketing rather than more capital-intensive activities. CEO Michael Johnson has been at the job since 2003. Prior to that, he worked for at Disney for almost two decades, where he ran Univision. Herbalife's products aren't particularly susceptible to technological disruption, though Buffett would likely be somewhat concerned with the risks inherent to potentially shifting consumer tastes in what is a developing industry. Regardless of whether Buffett would ever buy Herbalife, we've learned that it exhibits several of the characteristics of a quintessential Buffett investment: consistent or growing earnings, and high returns on equity with limited debt, tenured management, and a technologically straightforward industry. If you'd like to stay up-to-speed on the top news and analysis on Herbalife or any other stock, simply click here to add it to your stock watchlist. If you don't have one yet, you can create a watchlist of your favorite stocks by clicking here. At the time this article was published Ilan Moscovitzdoesn't own shares of any company mentioned.You can follow him on Twitter@TMFDada.Motley Fool newsletter serviceshave recommended buying shares of Walt Disney. Try any of our Foolish newsletter servicesfree for 30 days. We Fools may not all hold the same opinions, but we all believe thatconsidering a diverse range of insightsmakes us better investors. The Motley Fool has adisclosure policy.